Mike’s Birthday bash in Davis! This is a tale of adventure and drinking. Of reunions and new friendships, competition and group success. This is the story of a Californian Beerfest. Mike had moved out to Sacramento, in California, a few years back. We’d adventured together on my roadtrip, but I hadn’t seen him since. His birthday seemed a good enough excuse as any to fly down and spend a weekend rocking out. I mean… I hadn’t been to a real heavy-duty party in a very long time, so that was also a pretty good draw to get my out there. I’d booked tickets for the wrong weekend. One week late, to be specific. So the adventure really started on Thursday, when I started making frantic phone calls to the airline, trying to figure everything out and get new tickets for the right weekend. They happily oblidged, only bumping the ticket price up by a measly 150%… so my $200 round-trip flight turned into a $520 flight concerningly quickly. I left Hood River on Friday evening, driving into Portland right after work. I had a mission in mind, though not one that tied into the weekend party plans. Sarah’s parents were in town, and the timing was perfect for me to get to meet them quickly. Not long enough for us to do a fully awkward “Hi, I’m the new boyfriend, nice to meet you ohh god what do I say” thing, but just enough time to break the ice and chat for a bit, before I was forced to run and catch an airplane. And it worked flawlessly, in my opinion. I picked Sarah up from her work right on time, and then we made it back to her house with just enough spare time to destress and do some last-minute cleaning. We talked, introduced, and discussed the perks of being from New England along with the excellent places in New Zealand that we’d visited. Like I mentioned – just enough time to break the ice, and leave me wanting more time to get to know them. Just enough time before my scheduled cab arrived, and I was whisked away to jump into a small metal tube that went careening through the sky. Whatever. They didn’t, I flew, I napped, and then Mike picked me up at the airport. And seeing Mike was awesome – it’d only been a few months, but it seemed like forever. There was a party going on at his house when we walked in, but between drinks and games and rocking out we still made time to do some quick catching up before crashing out. How you start a party weekend is very important. A boring, poorly fed, unenergetic start can taint the whole adventure. Whereas a solid, happy, fueled and energetic morning can just jump start the whole day, and start everything off right. We started it off right. Tyler, Mike’s roommate, made breakfast sandwiches. He even made too many of them, so we got to have doubles. Then, we knocked back some excellent coffee, and did a quick grocery run to grab all the last little bits that the party needed. You know… Beer, ping pong balls, colored headbands to differentiate teams, string, that sort of stuff. Then. Then we headed back to the house and started into the main event. The main event, you may ask, what was that? Well, my friend, the main event was a recreation of the classic movie “BeerFest”, where we’d split everyone into teams (tied to counties, preferably, with the threat of being rebranded to “North Korea” as a threat to keep anyone from complaining about rules) and then proceed through a series of drinking games. Spin Bat – simple childs game, where you have to run to the other side of the yard, spin around a whiffleball bat a few times, and then run back. After chugging a beer, of course. War Pong – Where two teams line up, and play concurrent games of Beer Pong, but with fewer cups per person. First team to run out of cups has to drink the whole table. Quarters – Simple and efficient, the team who can bounce the most quarters into a shot glass wins. The looser has to chug a beer. After the first split, we took a break for snacks, refreshments, and a chance to tally points. No one really remembered points, if we’re being honest. But clearly my team won. Clearly. I am trustworthy, and not lying about how badly Tyler and Spring stomped us. We also spent more than a few hours lazing around in the pool, while Tyler cooked some amazing food for us all. Depth Charge – a new game to me, where you put a shot glass in a glass of beer, and slowly fill it up. The team that sinks the shot glass looses, and has to chug the beer. Noticing a pattern, yet? Thumper – I don’t even. Basically a memory game, where everyone makes silly signals and signs and slaps their legs and I don’t even know, whatever. Boot Race… the final battle!!! – This one was serious business. Very technical section. Line up teams, and have a straight drinking contest. First team to consecutively chug all their beers wins. Final member must drink from “DAS BOOT”. Once the games were over, partying and relaxing began in full. Wizard staffs are made (as you finish a can of beer, you tape it on top of your previous can. Thus making a staff. The tallest was 30+ beers) Alcohol was consumed, parties were had, and I crashed on the couch happy as a clam. I didn’t wake up unhappy, hungover, tired, or sore. Somehow, somewhere, someone was looking down on the house and saying, “well done, everyone. You earned a good Sunday, so please – have one on me”. I was the first awake though, so I took the chance to repay a debt that I had since I visited Davis during the roadtrip – when I partied then, Spring had done all the dishes before I was able to get up to help. So this time, since I was the first awake, I was able to jump into the kitchen and start getting things cleaned up. I even cleaned up, fixed, tested, and used Mike’s espresso machine. You know, the one that he bought nearly two years ago, but never got around to even plugging in? With the kitchen clean, we head to Black Bear diner for breakfast. Mike explains how the entire diner chain is an Illuminati front, and that the bears are actually the woodland critters from South Park. Mike is a very special man, and we all love him dearly. Well fed, Mike and I finished cleaning the house, and then headed out for a bit of biking around Davis itself… I’ve only visited twice, so the chance to actually see the campus and the back roads / bike paths was really excellent. Let’s be honest – even if I wasn’t feeling hungover, my body definitely wasn’t feeling completely up to snuff. So the relaxing bike ride was really exactly what I needed at that moment. The Yoga class that happened right afterward didn’t hurt either, especially since it was a super relaxing class, especially in comparison to Whitney’s classes that I’m used to (Ed Note: Whitney is the head trainer at the climbing gym that Ben went to in Cambridge. Her yoga classes are more accurately categorized as “core-focused torture”, versus simple “yoga”). I mean… the last 15min of class were literally us taking a nap, with lavendar warm towels on our foreheads. It was glorious. And then, I was flying. I was going to take the chance to get some writing done, but in all honesty I just relaxed, listened to music, and napped. Party weekends are tiring. But I was awake enough to pull off a scheme of which I’m quite proud… See, Sarah was going to be picking me up from the Airport. 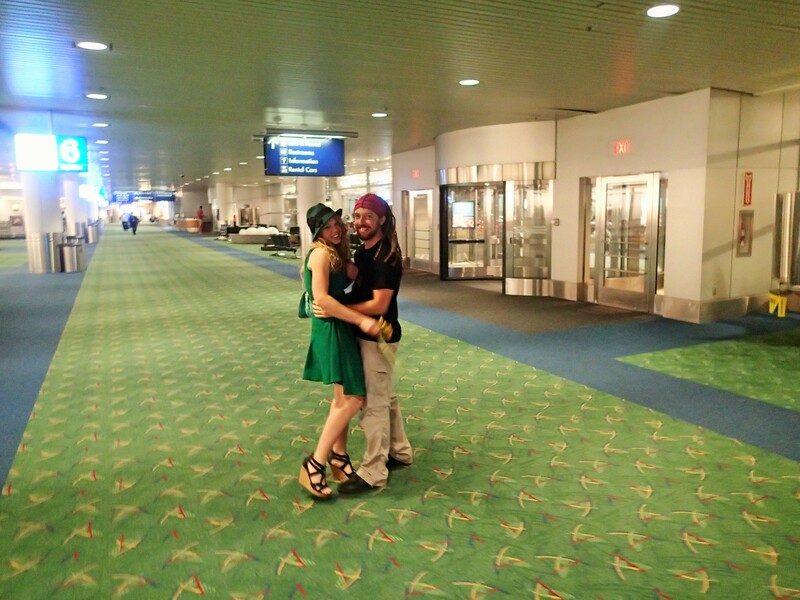 And although we’d only been dating for a week, I had a feeling that she would have thought up something sneaky and amazing as a “Welcome back to Oregon” thing. So I took advantage of that knowledge, and asked a fellow passenger to hold my camera, and take a picture of when she greeted me at the terminal. It was exactly as cute as you would expect.